New York, NY, February 24th, 2014 – CECP, a coalition of 150 CEOs who believe that societal improvement is an essential measure of business performance, announced today that Cargill and PG&E Corporation are the recipients of the 14th annual Excellence Awards. These companies were chosen by an independent jury as global leaders in corporate societal investment, exemplifying the Award’s four rigorous Standards of Excellence: CEO leadership, partnership, dedication to measurement, and innovation. The Awards were presented at the 2014 Board of Boards CEO Roundtable at the New York Stock Exchange in New York City by Douglas Conant, Chairman, Avon Products; Founder and CEO, ConantLeadership; and former CEO, Campbell Soup Company. Accepting on behalf of their companies were Gregory Page, Executive Chairman, Cargill and Anthony F. Earley Jr, Chairman, CEO, and President, PG&E Corporation. 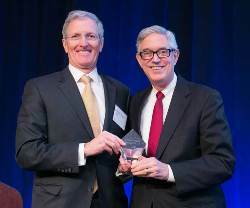 Pictured: Greg Page, Executive Chairman, Cargill, and Doug Conant, Chair, CECP; former CEO, Campbell Soup Company at the 14th annual Excellence Awards. The Chairman’s Award, for companies with revenues of $20B and more, was presented to Cargill for its work with CARE on the Rural Development Initiative, which harnesses the company’s passion for improving livelihoods by empowering smallholder farmers, strengthening agricultural supply chains, and alleviating poverty. Launched in October 2008, this partnership leverages their respective skills and experience – working with business units and local employees within important supply chains. The program has benefited more than 100,000 people in India, Ghana, Côte d'Ivoire, Egypt, Honduras, Guatemala, Nicaragua, and Brazil. The Excellence Awards Selection Committee was struck by Cargill’s focus on society’s great challenge—poverty—and their desire to strengthen the communities where they have a presence through the skills that are the fabric of the company. The President’s Award, for companies with revenues less than $20 billion, was presented to PG&E Corporation, for its work with Habitat for Humanity to provide renewable energy to hardworking families to keep home ownership affordable. The program’s goals include supporting the environment and fostering economic and community vitality. Over the last nine years, with the support of thousands of PG&E employee volunteers, the program has brought solar power to more than 500 Habitat homes in Northern and Central California, saving each of those families $500 annually on their energy costs. The Excellence Awards Selection Committee was impressed by the immediate impact on low-income families, as well as the scalability of the program and clear ties to PG&E’s business goals. “Solar Habitat has been such a success because it draws on our core skills and expertise in renewable power generation to create long-lasting benefits—not only for the Habitat homeowners but for the environment and the larger community’s economic health,” said Tony Earley, Chairman, CEO, and President, PG&E Corporation. Two additional Excellence Awards--the Directors’ Award, recognizing a partnership between a corporation and a nonprofit and the Charles H. Moore Award for Leadership in Corporate Community Engagement, celebrating a corporate community engagement professional who demonstrates perseverance in the pursuit of societal advancement--will be presented on May 20, 2014 at the CECP Summit. Additional information on this year’s winners can be found on the Excellence Awards section of the CECP website. Applications for the 2015 award applications will be available this spring at http://.cecp.co/EAApplication. Michael T. Duke, former CEO, Wal-Mart Stores, Inc.
For more information on the Force for Good Awards, please visit http://cecp.co/BoB. CECP is a coalition of CEOs united in the belief that societal improvement is an essential measure of business performance. 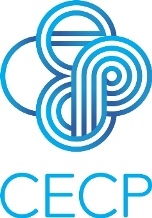 Founded in 1999, CECP has grown to a movement of more than 150 CEOs of the world’s largest companies across all industries. Revenues of engaged companies sum to $7 trillion annually. A nonprofit organization, CECP offers participating companies one-on-one consultation, networking events, comparative data, media support, and case studies on corporate engagement. For more information, visit http://.cecp.co. Pacific Gas and Electric Company, a subsidiary of PG&E Corporation (NYSE:PCG), and the PG&E Corporation Foundation strive to power strong communities throughout Northern and Central California. In 2013, PG&E contributed more than $23 million to more than 1,500 charitable organizations, including matching the generosity of employees who donated more than $6.5 million and volunteered more than 48,000 hours to company-supported events. Community investments are funded entirely by the company’s shareholders. For more information, visit www.pge.com/ and http://www.pge.com/about/newsroom/.